In the top of the table clash; Leicester took another big step towards a Premier League title with a 3-1 triumph over Manchester City at the Etihad. Robert Huth poked the Foxes ahead after just three minutes and early in the second-half Riyad Mahrez’s skilful strike doubled their lead. Huth grabbed a brace on the hour to send the visitors into dreamland before Sergio Aguero pulled back a late consolation for the hosts. Claudio Ranieri’s side now sit five points clear at the top, whilst City slip to fourth with a first defeat in eight league games. 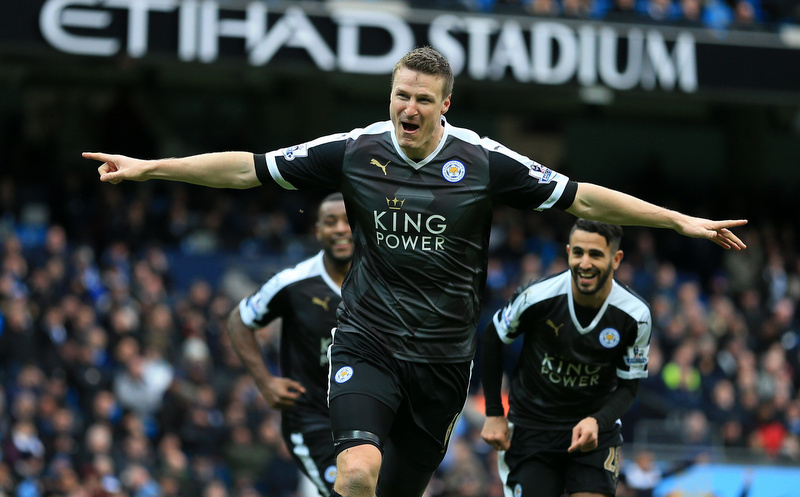 Defender Robert Huth scored twice, either side of half-time, to guide Leicester City to a thumping 3-1 victory at Manchester City. Tottenham moved into second with a hard-fought 1-0 win over Watford at White Hart Lane. Kieran Trippier’s first goal for Spurs just after the hour was enough, when he converted Dele Alli’s cross. Mauricio Pochettino’s side now sit five points off top spot following their fourth straight win, whereas the Hornets drop to tenth with one win from their last eight outings. Arsenal moved up to third with a 2-0 win over Bournemouth at the Vitality Stadium. Mesut Ozil smashed the Gunners in front and just 90 seconds later Alex Oxlade-Chamberlain’s drilled in a second goal. The win puts Arsene Wenger’s men one point above Man City; whilst the Cherries stay 15th, five points above the bottom three. Manchester United were denied a rare victory at Stamford Bridge by a stoppage-time equaliser in a 1-1 draw with Chelsea. Jesse Lingard’s superb strike on the turn gave the visitors the lead but a minute into stoppage time Diego Costa netted after going around Red Devils goalkeeper David De Gea. The point leaves United in fifth, six points off the top four whereas the Blues stay 13th with a sixth draw from their last eight games. 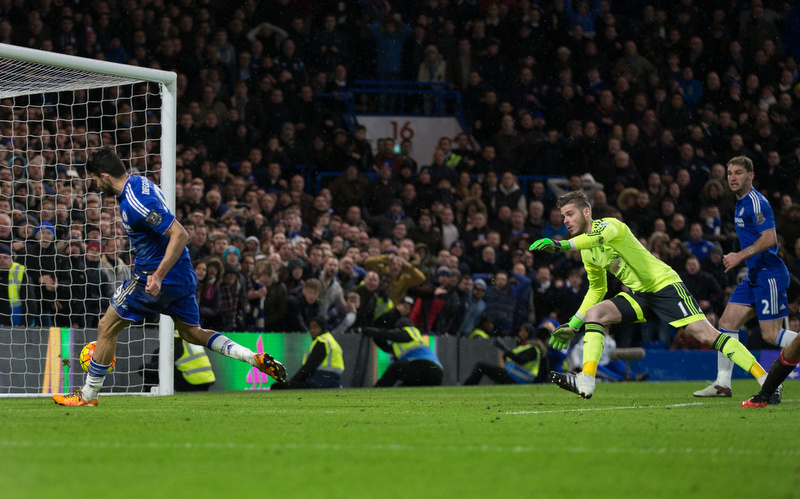 Diego Costa salvaged a point for Chelsea by netting his side’s equaliser in the 91st minute against Manchester United. 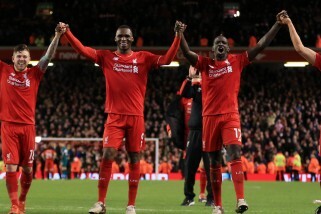 Sunderland came from 2-0 down to rescue a 2-2 draw against Liverpool at Anfield. Roberto Firmino headed the Reds in front on the hour mark before setting up Adam Lallana for the second. However with just eight minutes remaining; Adam Johnson squeezed a free-kick past Reds ‘keeper Simon Mignolet before Jermain Defoe smashed in an equaliser with just sixty seconds remaining of normal time. Jurgen Klopp’s side drop to ninth, whereas the Black Cats stay second bottom, still four points from safety. Aston Villa gave themselves another glimmer of hope in their fight for survival this season with a 2-0 win over Norwich at Villa Park. Joleon Lescott’s deflected header put the home side ahead on the stroke of half-time before Gabriel Agbonlahor’s finish six minutes into the second-half. Villa stay bottom; but now sit eight points from safety, whereas the Canaries slip into the bottom three following their fifth straight defeat. A stunning first-half display meant Everton saw off Stoke 3-0 at the Britannia. Romelu Lukaku’s penalty put the visitors ahead after 11 minutes before a Seamus Coleman header and Aaron Lennon’s finish sealed the game before the break. The Toffees move up to eighth with a second successive win, whilst the Potters are now in the bottom-half of the standings after a third straight defeat. Newcastle moved out of the bottom three with a 1-0 win over West Brom at St. James’ Park. The only goal of the game came just after the half hour mark, when Aleksandar Mitrovic calmly finished after being sent through on goal. The Magpies move a point above the relegation zone, whilst Albion are 14th and without a win in five. Southampton continued their good run of form with a 1-0 win over West Ham at St Mary’s despite being reduced to ten men. Maya Yoshida’s goal after just nine minutes was enough for Saints, despite seeing Victor Wanyama shown a straight red card early in the second-half. Ronald Koeman’s side move up to seventh and are unbeaten in five, whereas the Hammers stay sixth. Swansea and Crystal Palace shared the points in a 1-1 draw at the Liberty Stadium. Gylfi Sigurdsson’s free-kick gave the home side the lead before Scott Dann poked in his fifth goal of the season for the visitors. The Swans stay 16th, four points above the drop whilst Palace stay 12th but are without a win in eight.